STARK-B contains calculated widths and shifts of isolated lines of neutral and ionized atoms due to collisions with electrons and ions for various series of temperatures and densities. The lines are described by their quantum numbers and their calculated wavelengths. Parameters giving the validity condition of the “isolated line approximation” are also provided. The widths (total widths at half-maximum intensity) and shifts for the different perturbers entering the tables are given in Å. The data are provided for individual lines and only for multiplets when LS coupling is valid. The tables also include references to the corresponding published papers. The tables also contain fitting coefficients as a function of temperature devoted to scientific modeling. All the provided data can be downloaded in ASCII or VO format. STARK-B is devoted to modeling and spectroscopic diagnostics of stellar atmospheres and envelopes. In addition, it is also devoted to laboratory plasmas, laser equipments and technological plasmas. So, the domain of temperatures and densities covered by the tables is wide and depends on the ionization degree of the considered ion. The temperature can vary from several thousands for neutral atoms to several hundred thousands of Kelvin for highly charged ions. The electron or ion density can vary from 1012 (case of stellar atmospheres) to several 1019cm-3 (some white dwarfs and some laboratory plasmas). 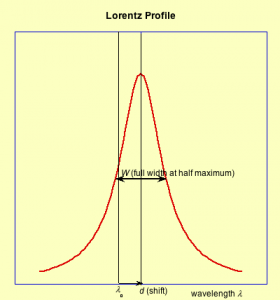 The impact approximation and the isolated line approximation are applied, so that the line profile is Lorentzian. The basis for calculations is the computer code which evaluates electron and ion impact broadening of isolated spectral lines of neutral atoms and ions, using the semiclassical-perturbation approach developed by Sahal-Bréchot (1969ab, 1974), and supplemented in Fleurier et al. (1977), see below. This computer code has been updated by Dimitrijević and Sahal-Bréchot in their series of papers, Dimitrijević and Sahal-Bréchot (1984) and following papers. The data are derived from this series of papers and are cited in the tables. The accuracy of the data varies from about 15-20 percent to 35 percent, depending on the degree of excitation of the upper level, and on the quality of the used atomic structure entering the calculation of scattering S-matrix leading to the widths and shifts. The more the upper level is excited, the more the accuracy is good. In the earlier papers, the used atomic structure was the so-called “Bates and Damgaard” one (Coulomb wavefunctions + quantum defect). More recent atomic structure data are introduced in the latest papers. STARK-B also includes data obtained using the MSE (Modified Semi-Empirical) method (Dimitrijević & Konjević 1980, Dimitrijević & Kršljanin 1986, supplemented by Popović & Dimitrijević (1996) for complex atoms). The MSE (Modified Semi-Empirical) method may be used when we have not a sufficiently complete set of energy levels for anadequate semiclassical treatment. Cf. http://stark-b.obspm.fr/index.php/introduction for more details.